12. Anemone L., Sp. Pl. 538. 1753. Gen. Pl. ed. 5:614. 1754, G. Pritzel in Linnaea 15:561-698. 1841, Boiss., Fl. Or. 1:9. 1967, Hook.f. & Thoms. in Hook.f.. Fl. Brit. Ind. 1:7. 1872, E. Ulbrich in Engler, Bot. Jahrb. 37:172. 1906 & Verh. Bot. Vet. Prov. Brandenburg 48:1. 1906, S.V. Yuzepchuk in Komarov, Fl. URSS. 7:236-282. 1937, Qureshi & Chaudhri in Pak. Syst. 4(1-2):104.1988. National Herbarium, Pakistan Agricultural Research Council, Islamabad, Pakistan. Perennial herbs, with a tuberous or fleshy cylindrical woodstock. Stem simple or branched. Leaves compound in various ways, usually palmatisect or palmatipartite, sometimes only stem leaves verticillate, forming an involucre. Flowers solitary or in cymose, umbel-l ike inflorescences, sepals 5-20, petaloid. Stamens numerous. Carpels numerous, arranged in globose heads or cylindrical spikes. Ovule pendulous, seeds with one integument. Many species are poisonous, some are cultivated as ornamental plants. The genus comprises of about 150 species and has a world wide distribution. In Pakistan, represented by 7-8 species. Anemone biflora DC., Syst. Nat. 1:201.1818, Boiss, Fl. Or. 1:12.1867, Tamura in Kitamura, Fl. Afghan. 119. 1960, Qureshi & Chaudhri in Pak. Syst. 4(1-2):107.1988. The occurence of this taxon in Pakistan is doubtful. Boissier (l.c.) cites a gathering from Baluchistan which I have not been able to verify. The specimens mentioned by Stewart [Ann. Catalogue Vasc. Pl. W. Pak. & Kashm. 260. 1972] under this name belong to Anemone tchernjaewii which closely resembles Anemone biflora, but differs in the shallow cut primary segments of leaves. 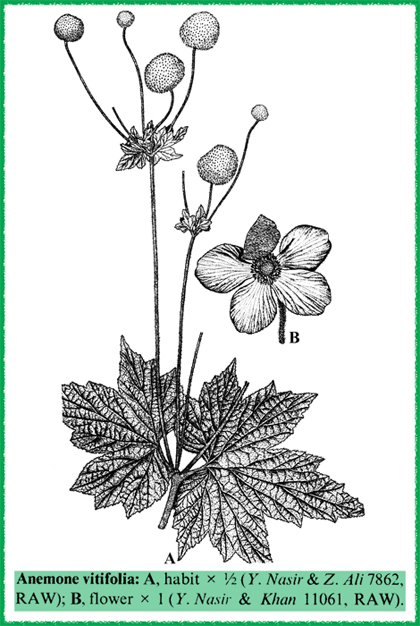 The general distribution of Anemone bifora is in Iran and Afghanistan. Anemone dubia Wall. ex Wight & Ann. = Anemone rivularis Buch. -Ham. Anemone geraniifolia Wall. = Anemone rivularis Buch. -Ham. Anemone rupicola var. glabriuscula Hook.f., & Thoms. = Anemone rupicola Camb. Anemone rupicola var. sericea Hook.f. & Thoms. = Anemone rupicola Camb. Anemone wightiana Wall. ex Wight & Arn. = Anemone rivularis Buch. -Ham. Hepatica falconeri (Thoms.) Yuzepchuk = Anemone falconeri Thoms.